THIS PATIENT had always been a strong, healthy, hard-working man before the development of the epithelioma, and had worked generally with a pipe in his mouth. Two and a half years before the picture was taken, a small lump began to be felt on the left side of the lower lip. This became hard, superficially eroded, and covered with a scab. Gradually the growth invaded the greater portion of the lip, although it was over two years before destructive ulceration began. 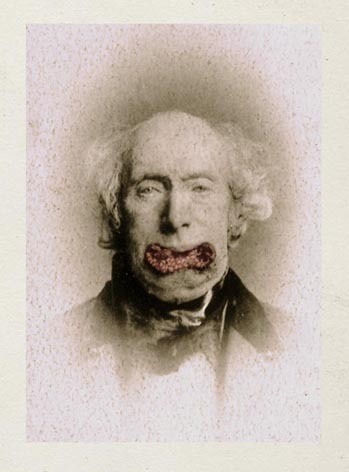 In the central portion of the lip there had been loss of tissue, and there was such a continual dribbling of saliva that the patient usually kept a handkerchief pressed upon his chin, and in sitting for his photograph it was necessary to put a rubber cloth over his breast to protect his clothing. The treatment of epithelioma usually demands prompt and active measures. The earlier the patch can be destroyed the better. When progress is very rapid, the immediate removal of the diseased part, or its complete destruction by means of a powerful caustic, is the only treatment worthy of being considered. In cases where the disease is not progressive, and especially where the patient objects to the knife or cautery, I would advise arsenic in small and long-continued doses. In the use of caustics failure and even harm often results from an insufficient application of the caustic, through fear of going too deeply, or causing too much pain. The growth, instead of being totally destroyed, merely becomes inflamed, and is stimulated to further increase in extent. I've asked and asked why God afflicted me. perhaps something I neglected to do. But could it have merited such rebuke? whose lips I'd still be kissing had I still lips. set to do wonders, went undelivered. and had so many friends—note the past tense. Is there any meaning to this at all? Perhaps it's in how I carry the pain. but that's a fact that little comforts me. is worth more to me than my whole life's worth. and tripped: rock and stumble and trip: that's all. shimmering disasters of air and light. melancholy, but Dr. Fox will help. for surely there must be some meaning here.